Annie Unrein was looking for a little extra money to support her quilting habit and she found the ideal solution: creating quilt patterns and starting her own business, Patterns by Annie followed by www.ByAnnie.com. While working as a scrap booking consultant, Annie developed her first pattern, an organizer to hang on the back of a door and today she has 98 published patterns with two more to make and even 100 coming soon. "Many of my quilt patterns begin in my head. Heather Purcell, Mother Superior of Superior Threads, is my friend and has partnered along the way,” says Annie. “We will ‘play’ with designs. I'll do a rough pattern. Heather will make the quilt and have it quilted. Then I'll come back and finish the pattern. Superior Threads has a beautiful quilt for their booth, and I have a finished pattern." Annie makes extensive use of Texture Magic and her own product, Soft and Stable. Both have been "adopted" by Eazy Peazy for our patterns because they produce such beautifully finished items. To date she has done 30 patterns for using Texture Magic and more are in the works. Soft and Stable came about because Annie had used similar products but felt they just didn't quite do the job. 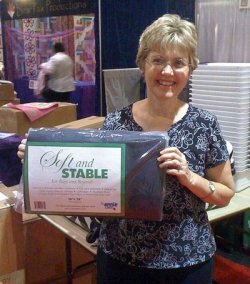 So she tested and re-tested materials made to her specifications before introducing Soft and Stable at 2010 Fall Quilt Market. It was an instant hit and recently Annie introduced a version in white in addition to the original black.